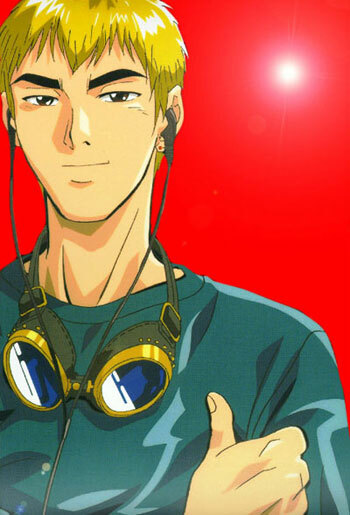 GTO - Great Teacher Onizuka - has come back as the animated series. Based on the popular comic book, Eikichi Onizuka, a young school teacher, gives a very practical lessons of life to his students. He may not be an excellent teacher in the conventional meaning, but his honest and straightforward way of being with students certainly make changes in students' attitudes and lives. Eikichi Onizuka is 22 years old. He was an infamous delinquent riding the bike around like the Hell's Angels when he was in high school. Somehow he managed to graduate from college, and surprisingly obtained the teaching license. Nobody imagines that he would be a teacher, but he has a huge ambition: To become a great teacher who could be a legend. Of course, he's not an ideal person for a teacher. He likes to watch X-rated movies and to search in the garbage bins for something useful. He wears earrings and dyes his hair to blonde. He is assigned to a private junior high school and teaches sociology. What kind of joke is that? That's everyone thinks. But Onizuka has a policy. He was a bad boy, but he doesn't like anything unfair. He may not be so intelligent as a teacher, but he has something special which makes inferior students think. He doesn't show any sympathy to weak-minded students, but let them raise up some courage instead. Onizuka doesn't look at the students from the teacher's point of view, but from the same position as the students. That's why students gradually open up their minds to him. There are so many problems in school, but Onizuka faces bravely and straightforwardly. There are unique people around him. Azusa is a beautiful Japanese teacher who seems to like Onizuka. Ryuji Danma is Onizuka's best friend from high school who is a manager of a bike shop now. He understands Onizuka very well and tries to support him whatever he does. Hiroshi Uchiyamada is the head teacher at school who hates Onizuka and tries to get rid of him. Sakurada is the chairman of the board of trustees of this school. She observes students and teachers while she is working at the shop in school. Let's see how Onizuka grows up with students as a teacher as well as a person. Based on the comic "GTO" by Tohru Fujisawa originally serialized in the Weekly Shonen Magazine published by Kodansha Ltd. © Tohru Fujisawa/ KODANSHA • FUJI TV • ANIPLEX • PIERROT. Licensed by FUJI CREATIVE CORP. through Animation Int'l Ltd. #1: 60 MIN; #2-43: 30 MIN.